Mary Malinda Edwards is the daughter of Norman Ulysses Edwards (Sr.) and Luzetta Blodgett. She was born 16 May 1872 in Sabetha, Brown, Kansas. She died on the Fourth of July 1958 at age 86 in Hill City, Graham, Kansas and is buried in the Hill City Cemetery. On 3 March 1889, she married Andrew Jackson Swaim in Hill City, Graham, Kansas. He is the son of Henry Swaim and Mary. He was born on Christmas Eve, 24 December 1854, in Des Moines, Polk, Iowa. He died 6 December 1935 at age 80 in Hill City, Graham, Kansas and is buried in the Hill City Cemetery. Thirza May Swaim was born 7 October 1890 in Hill City, Graham, Kansas. 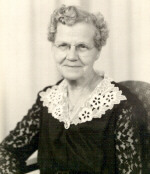 Lucy Helen Swaim was born 4 March 1897 in Sabetha, Brown, Kansas. Leota Luzetta Swaim was born 18 May 1899 in Hill City, Graham, Kansas. She died 27 July 1900 at age 1 in Hill City, Graham, Kansas and is buried in the Hill City Cemetery. Mary and Andrew: Births and Deaths from their gravemarker in the Hill City Cemetery. Mary: 1880 census. Gettysburg, Graham, Kansas. Page 9. 1900 census. Gettysburg, Graham, Kansas. Page 2. 1910 census. Indiana, Graham, Kansas. Page 3. 1920 census. Indiana, Graham, Kansas. Page 5.